I thought of you immediately after hearing, Robert. You knew Kim FAR better than I. Frankly, you're the person closest to me who was closest to Kim, and you and I have lost too much touch since KSP closed -- a fact that's really hammered home by Kim's passing. I'm very sorry to be writing this meager note. And I'm sorry for comics. And sorrier still for the loss you feel. I was just thinking about Skin Eater the other day, coincidentally. Heh, thinking about it now is brightening my day a little... Thanks for the note. Thanks for writing that, Robert. Kim will be sorely missed. Thanks for sharing that, Robert. 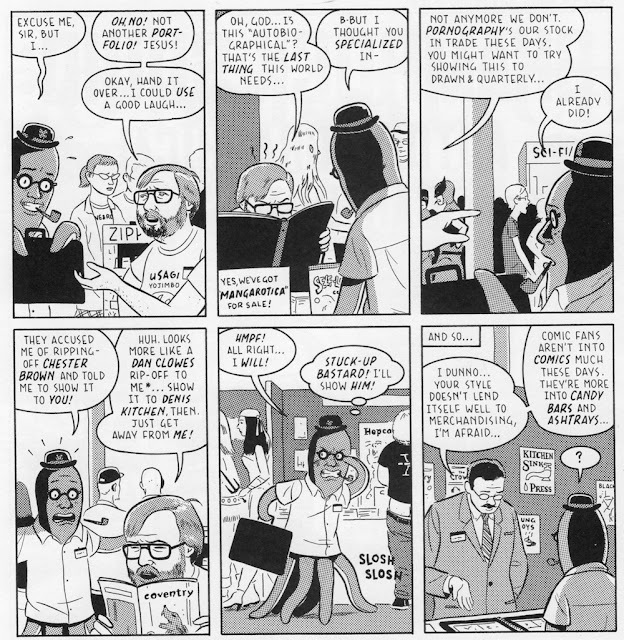 I still remember the packet of Fantagraphics stuff you sent me shortly after you started working there, as way of announcing your new gig. Great remembrance of those times.